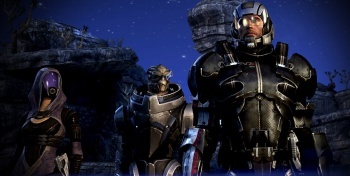 Like a cat in a box, BioWare Montreal boss Yanick Roy says the next Mass Effect game both is and is not Mass Effect 4. BioWare Community Coordinator Chris Priestly made an interesting comment a couple weeks ago when he said that calling the next game in BioWare's space opera franchise Mass Effect 4 is "doing it a disservice," and claimed that he never refers to it by that name during internal conversations. "I see people saying 'well, they'll have to pick a canon ending'," he wrote. "No, because the game does not have to come after. Or before. Or off to the side. Or with characters you know. Or yaddayaddayadda. Wherever, whenever, whoever, etc will all be revealed years down the road when we actually start talking about it." It's actually a pretty straightforward idea - don't make assumptions about the next Mass Effect - but as the conversation continued, BioWare Montreal Studio Manager Yanick Roy decided to inject some clarity into the situation. "What Chris is saying is that thinking of the next Mass Effect game as Mass Effect 4 would imply a certain linearity, a straight evolution of the gameplay and story of the first three games. But because we are switching to a new engine and need to rebuild a bunch of game systems, we have an opportunity to rethink how we want these systems to be going forward instead of just inheriting them from the previous games," he explained. "Story-wise, the arc of the first trilogy has also been concluded, and what we will do is tell a new story set in the Mass Effect universe. That doesn't mean that events of the first three games and the choices you made won't get recognized, but they likely won't be what this new story will focus on," he continued. "In other words, because the game takes place before of after the first trilogy does not mean it necessarily is a straight prequel or sequel." I would hazard a guess that BioWare would also like to draw a line under the Commander Shepard trilogy in order to distance it from future games in the minds of people who either loathed the ending of Mass Effect 3 or can't imagine a Mass Effect game without the crew of the Normandy. That's a big hill to climb, and BioWare would very likely prefer to do it with as fresh a start as possible.